Sydney Shade Sails full list of Shade sail post accessories, ready to maintain the longevity of your existing shade structure. At Sydney Shade Sails our shade sail posts and poles are all built with high quality premium materials to ensure they can withstand knocks and bumps through general use, as well stand strong through periods of harsh weather. Our quality materials combined with expertise workmanship mean you can rely on a shade sail post or pole to keep your structure standing for years to come. Our goal at Sydney Shade Sails is to keep our clients comfortable in the great outdoors, whether that’s providing shade from the sun or shelter from the rain. When you buy from Sydney Shade Sails you can expect quality service, installation and care allowing the freedom to enjoy being outside with a shade sail from Sydney Shade Sails. From time to time, shade sails may need repair or maintenance. This could be as simple as retensioning your shade sail after many years of stormy weather have passed to put a bounce back in your sail. There is nothing worse than a saggy sail flapping, and often this is an easy fix. Shade sails can also benefit from being washed over the years, especially if they have been installed to stop leaves falling on an area. We have happy customers who have built shade sails to serve as carports and entertainment areas that were already shady but suffering from leaf drop. The leaves fall on the shade sail and can be blown off periodically to keep the sail tidy. We offer a shade sail cleaning service for when this isn’t enough and you want it looking new again. We also offer routine shade sail repairs in the event of normal wear and tear. Things like your sail needing to be re-tensioned or minor shade cloth repair are both easy and affordable with our company. 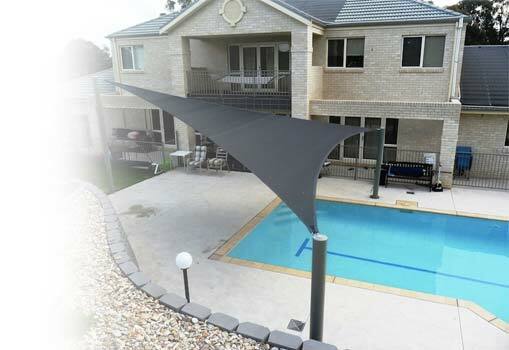 We offer some of the best shade sails repairs in Sydney, and it’s easy to contact us if you need routine maintenance. Our friendly and professional staff will come out to your property and assess the damage. While we are on your property, we will walk you through the repair process and ensure that you have a good understanding of what has to happen. We will fix your shade sail using a durable PTFE thread, and this thread has a longer life expectancy than other threads. Our staff will get your shade sail repaired and back into place quickly and efficiently so you can get back to enjoying your space as soon as possible. Occasionally, as is the case in severe storms, shade sails need to be replaced. At Sydney Shade Sails, we use PTFE thread to sew our shade sails. This has exceptionally high resistance against UV light, meaning that we can offer a lifetime warranty on all our stitching. Not all shade sails are made using this, and sails made with UV resistant thread, which has a limited lifetime, meaning that sometimes the stitching comes undone before the sail is ten years old. We offer a restitching service, using PTFE thread to ensure that stitching won’t come undone again.